In our modern digital age, news comes at you fast. Never before has the spread of information traveled so quickly or social media been so influential. And never before have problems been exacerbated so rapidly. The West is in turmoil, as chaos seeps into the very fibers of the institutions built up by global elites over the last century—institutions now finding themselves under assault. Anyone paying attention, or reading my series of articles, knows there is a massive shift occurring in the zeitgeist of the West. It’s a shift that only occurs once in a lifetime, if at all. We truly do live in interesting times, but they are dangerous too. The risk of structural collapse in many of our political systems is at all-time highs, with citizens all across the West demanding change from their leaders. People are rapidly descending into "tribes", consumed with self-reassuring, confirmation bias-assuaging articles written by their fellow "tribe" members. Whether this comes from the "radical left" or the "alt right" doesn't matter. What does is the damage it is doing to our systems and the risk they now pose to the dwindling minority of sane centralists. We see this change unfolding in front of our eyes, as scarcely a day goes by without reading about another "crisis” that threatens the very fabric of our society. Within the past week alone, depending on which "tribe" you belong to, there have been numerous victories or catastrophes develop in rapid succession. Last night, President Trump scored another major victory in the name of conservatives within the United States when he announced the nomination of his second Supreme Court pick, Judge Brett Kavanaugh. This came after Justice Anthony Kennedy announced his retirement a few weeks ago. 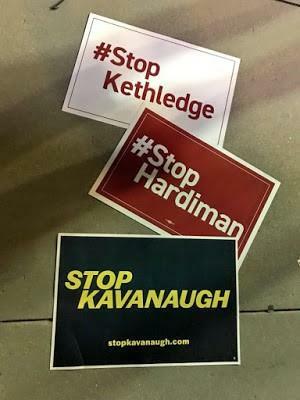 Displaying true tribalism, far left groups planned to protest Trump’s nominee well in advance, despite not knowing who the pick would be or what their track record was. Essentially causing them to create a series of talking points they could pick from and fill in the blanks. Obviously, this is an irrational way of pushing your ideology, and it severely discredits your movement. Regardless, the protests continued. The MSM closely covered the event and, of course, refused to point out key facts, something they have become increasingly efficient at as they descend into tabloid status. Theresa May finds herself on the receiving end of a full blown mutiny within her party, as she continues to lose the support of her peers and the public at large. This has been a rapid descent, as many within the British public are openly criticizing her for her role within the BREXIT negotiations. She has taken a very soft approach that has left the UK at the mercy of the European Union, as she continues to relent to their ever-increasing demands. This, however, will not continue. A massive shift is occurring, as numerous key members of her party have signed their resignation letters. This includes Boris Johnson, whom many would like to see as the next Prime Minister. I predict that, ultimately, this will result in Theresa May stepping down herself, even as she continues to plead for unity within her party. These two stories alone would be massive news, but the fact that they are occurring within a week of each other just goes to show how quickly the times are accelerating and how unstable the current systems within the West are. Madness is seemingly all around us, much of which is made that much worse by a MSM that blows every small detail out of proportion, recklessly and selectively reporting only the facts that help push their narratives. Truly, this is one of the most unstable time periods within modern history, one that could see a cascading chain of events unfold at a moment’s notice. Be prepared, be alert, be a part of the solution. Spread the truth.